We have been experimenting with different snacks and “treats” around here. Being that we cut out all the processed snacky food, so there is no more grabbing a box of something. We have to get creative and our latest favorite is apples and dates. 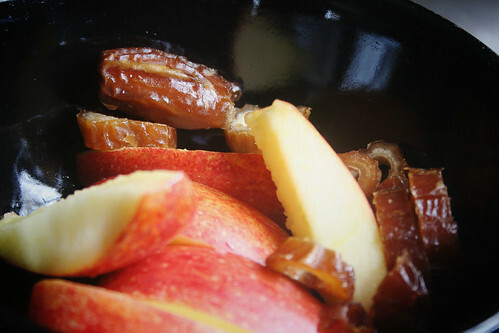 Did you know that apples + dates = caramel apples! Yes…it’s true! Get some medjool dates…or any other creamy type of date. Now, take one bite of apple, and one bite of date…and enjoy 🙂 It’s like heaven. It does taste just like a carameled apple. If you want to get fancy, you can soak 8-10 dates in water, and then blend them to make a caramel sauce to dip in. Bella likes them cut into little “rings”. I think dates might be my new favorite thing!! They are addicting though, so I have to limit myself to a few, lest I overdo it! Silly question – where do you buy dates? I’m not sure I’ve ever seen them before! Can you give me Date 101? Thanks! This recipe looks yummy, though, and would LOVE to try it! Lindsay…thanks so much for the kind words! shepav…you should be able to find them at any health food store and sometimes at conventional grocery stores (many of which now have organic/natural sections where you could find them). You could also order online. Sun Organics would be a great place to check out. There are tons of varieties to try. Hi! I’m a lurker, but just wanted to say how much I’ve enjoyed your blog. I bought some medjool dates the other day to make the raw almond/date balls that you wrote about and I’d love to make a “carmel” sauce for my kids – but I have no idea how long to soak them. Any suggestions? Thanks! Leslie…you can just soak them until they are soft. Luke warm water should do it. 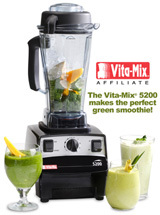 Then, just use that same water and throw it all in the blender or food processor to cream it together. Experiment with the amount of liquid to get it to the right consistency. I am also all about FIGS. I noted your blog entry on them and thought “oh yeah”. I also have to hold myself back on them. Medjool dates are hard to find around my area so I’ll check out your link and order there. Thanks to your encouragement, I just bought some medjool dates for the first time today, Sara! I have always enjoyed dried dates, but had never had fresh. And you are indeed correct–they are so scrumptious, just like candy. And I found them at Trader Joe’s for about $4.50, doubt know how many ounces, but it was a fairly large container. Anyway, the man that owns the natural food store here said all the same things you’ve taught us! And he is a huge Ron Paul supporter. It was nice talking to him. He gave me a book called “Milk A-Z” by Robert Cohen. Very interesting stuff. I’m so glad! I know…isn’t almond butter the BEST? My favorite thing to do is slice up bananas, drizzle almond butter over it, add walnuts, and top it agave nectar. It’s better than any dessert! As for the almond milk…it may take a little getting used to if you’re used to cow’s milk. But trust me, the more you read about milk and it’s effects on your body, the less you will miss it 🙂 You might experiment with making your own almond milk…click the link “almond milk” in the categories on the right. There is a great video demonstrating how to make it as well…the video is by Darryl Hannah and it’s all about live foods, but there is a nut milk section in there…click here to view it. That is a great idea! Dates will be added to my shopping list this week. I love your blog! I recently sampled some strange combinations that I think you might get a kick out of. Keep up the good work! Ann, I saw your comment about your transition to almond milk. Just thought I’d let you know that my family and I have found that the BEST brand of store bought almond milk is “Almond Breeze Vanilla.” I soars above in taste quality and creaminess, compared to other brands. It really tastes great, and no chalky aftertaste. Is there much difference in the fat and calorie content between cows milk and almond milk? Another suggestion..if you’re having trouble adjusting to the almond milk, I often buy vanilla almond milk or hazlenut milk to mix it up a bit. The vanilla almond milk in cereal is amazing. Thanks for the reply, Sara and Sarah B.! I will have to try Almond Breeze Vanilla. I bought “Pacific Natural Foods” unsweetend vanilla, and it is chalky. I think that’s what bothered me most, the texture. I should try it in cereal though, like Heather suggested. I saw medjool dates at our health food store today and thought of you so I had to pick some up. I’m excited to try this, and I think my toddler will like it too. Thanks for all the great tips! I just wanted to jump in and say that I found some organic Medjool dates at my local grocery store today and OH MY GOSH they are so yummy!!! I am so going to try the apple and date combo!!!! They taste just like carmel, hopefully if I can keep those on hand I won’t crave sugary snacks I’ll be craving dates!! !